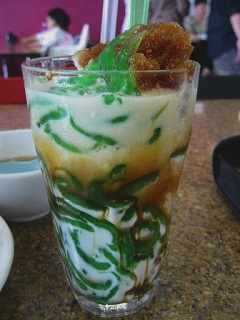 Cendol (English pronunciation: /?t? ?nd?l/) is a traditional dessert originating from South East Asia which is popular in Indonesia, Malaysia, Singapore, Vietnam, Philippines, and Southern Thailand (where it is called lortchorng Singapore). In Vietnamese cuisine, a similar dish is called che ba mau or che th?p c?m. Source: Wikipedia. The dessert’s basic ingredients consist of coconut milk, a worm-like jelly made from rice flour with green food coloring (usually derived from the pandan leaf), shaved ice and palm sugar. Next to these basic recipe, other ingredients such as red beans, glutinous rice, grass jelly, creamed corn, might also included. In Singapore, you can find this dessert available almost at most hawker centers or foodcourts. My favourite visit for this particular dessert will be at the Tekka Market (picture right) which is located in Little India. Althought it has a strong caramel and coconut creamy taste, it preserves the "kick"" in it. But for those who want to experiment your own skill of making it, here is the recipe.. Discard water, rinse, place in container, and refrigerate until use. Make a caramel first. Pour the water as soon as possible, watch out for the steam, it is very hot. Stir to dissolve. Add the brown sugar, and add water as needed. Simmer until the sugar dissolve and filter if necessary. Let it cool and chill. Bring coconut milk, a dash of salt, add in screwpine leaf to a boil. To serve: spoon cendol, sugar liquid and coconut milk into serving glass. Serve, enjoy!